It is winter and Hedgehog is asleep. As spring arrives he awakes and ventures out from his warm, cosy home in a tree trunk.He is hungry in the spring and as he wanders he spots a worm, a caterpillar, a beetle and a slug. They provide him with food for it is spring and he is very hungry after his winter's rest.Another in the easy reading series, which is well illustrated and uses large type made for easy reading for the children. Using limited text and plenty of visual clues, Beverley Randell tells the tale of a little hedgehog who wakes up in the spring and looks around for various insects to eat. 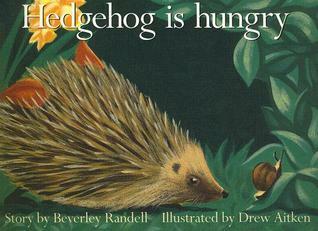 Hedgehog is hungry in the spring.My children loved this book. It goes well with Baby Lamb's First Drink as they share much of the same vocabulary.Baby Lamb's First Drink Unit Study for more beginning reader activity suggestions.